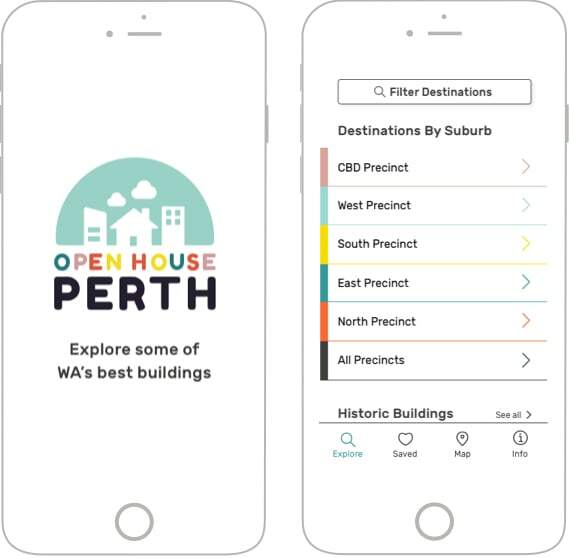 The Open House Perth (OHP) event is a free, annual architecture event held in Perth, Western Australia. Over one weekend in November each year a variety of commercial and cultural buildings is open for viewing by the public. Many destinations offer free public tours and talks and enable visitors to talk to the architect or owner of the building. The goal of this self-initiated side project was to increase the number of new and returning attendees by improving the event experience for them. As an avid event attendee I was irritated by the fact that it was quite difficult to effectively plan my visit to the different destinations. 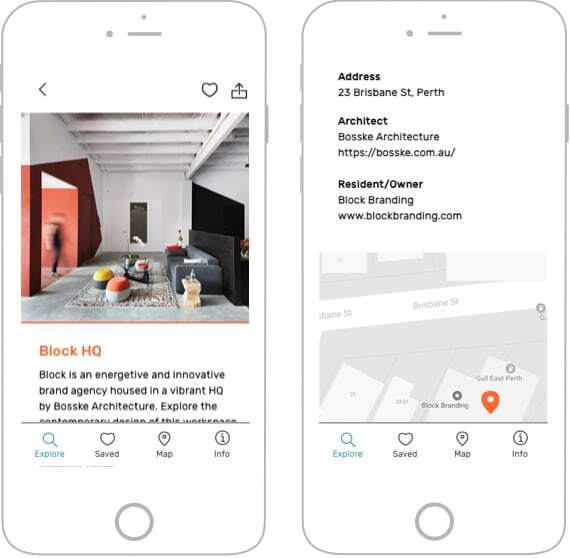 The event organisers used a responsive website, as well as a printed brochure to list available destinations and show their physical location. In order to determine which destinations I wanted to visit during the 2-day event, I had to consult the website and printed brochure and manually write down destination opening times/days and locations. I was certain this could be done better! 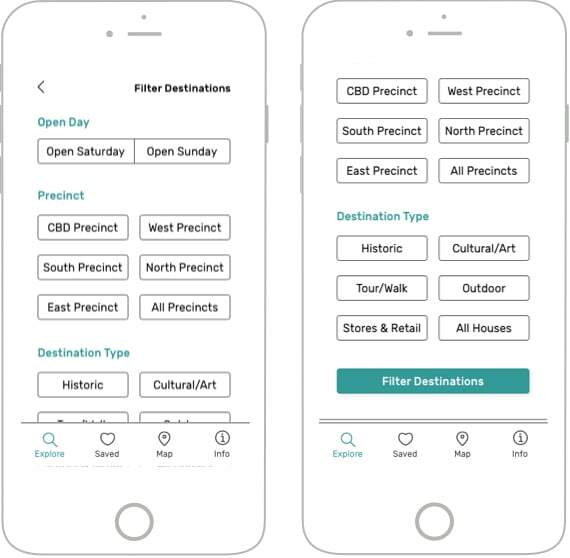 As a UX/UI Designer I designed a mobile application that lets visitors explore and search for destinations using specific criteria, as well as create a ‘saved destinations’ list to improve the experience before and during the event. For my work I utilised the pre-existing brand guidelines developed by Aimee Chappell. 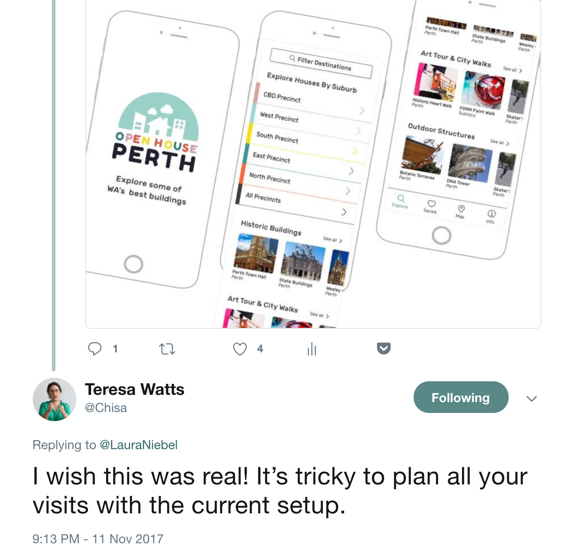 Since this was my own self-self-initiated side project, I didn’t work with an actual client but used my own experience as an event attendee to establish possible project goals and app features. Moving from hand-drawn sketches to wireframes and interactive InVision prototypes I constantly iterated on the user interface as well as user experience. 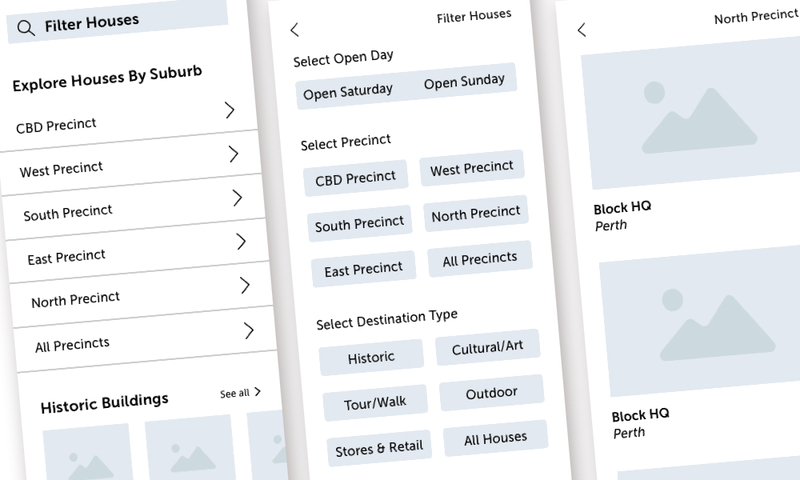 The app I created lets event attendees browse, search and filter destinations easily by destination type, suburb or open day. 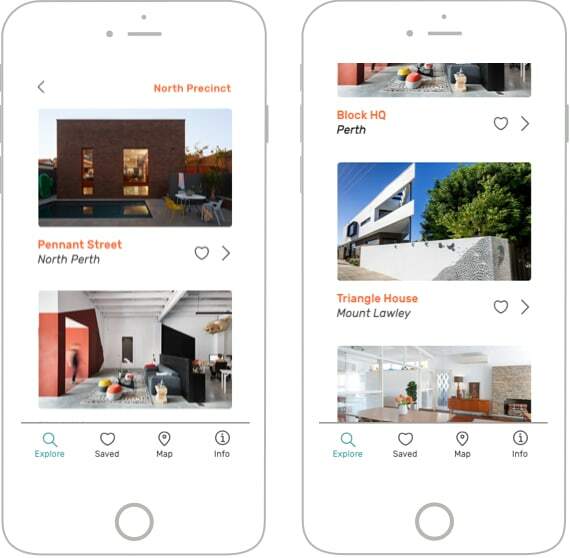 Each destination can be explored further, and users can access additional details such as a brief location description, architect and owner info, as well as an interactive map. 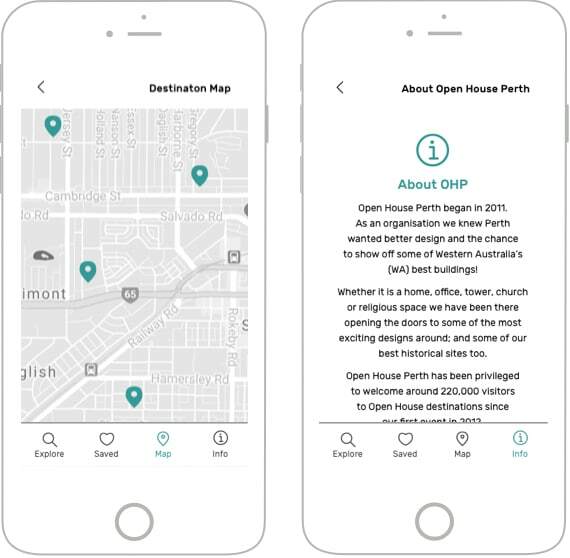 A destination map – accessible at any time at the bottom of the screen – helps users to judge the distance between different locations and allows them to quickly make their way from one destination to the other. I made planning for the event easier by implementing a 'saved destinations' feature. 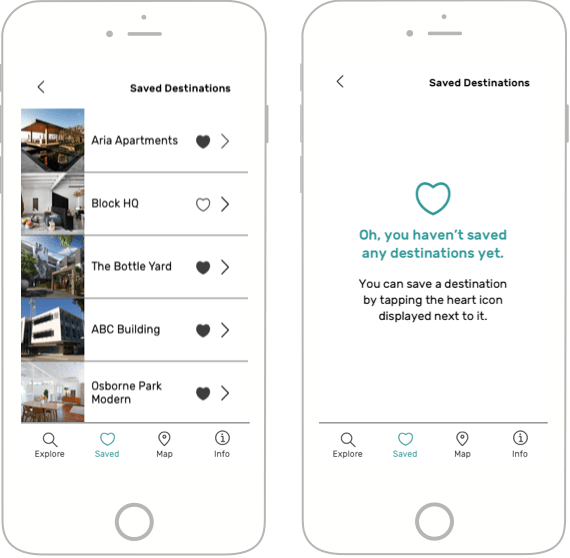 Users are able to save destinations they might like to visit by tapping the empty heart icon. All saved destinations are then shown in a scrollable list, which can be accessed at the bottom of the screen at any time. Users can also 'unsave' destinations at any time. 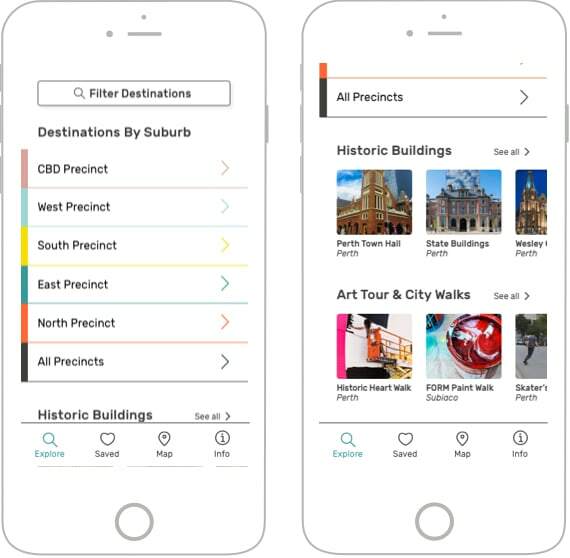 This functionality avoids users having to write down destination details by hand and speeds up the planning process considerably.